The boating world is full of tradition, ritual and quite a bit of superstition. Of course, any endeavor where you take your life in your hands — or, more accurately, hand your life over to the whims of Mother Nature and King Neptune — is worthy of all kinds of superstition, blind faith and silent prayer. — If there’s a red sky at morning, take warning! Although, in today’s age of science and skepticism, some boaters look a little askance at these pearls of wisdom, all it takes for many to change their minds and take heed is to start a voyage on a Friday and subsequently run into some big challenges at sea. 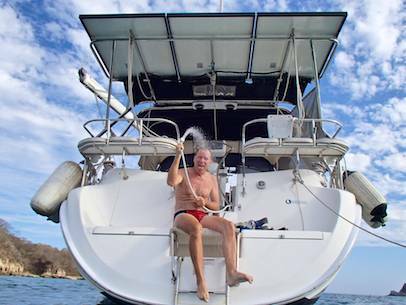 Along with cracking a bottle of champagne across the bow, some new boat owners go through special ceremonies and rituals to change the names of their boats and circumvent the wrath of the sea gods. And most sailors, even those on Navy ships, go through unique rites for crossing the Equator for the first time. But I’ve never heard of a nautical ceremony for saying goodbye to your ship, and wishing it fair winds and safe voyage, when you pass its command on to new masters. As we prepared to leave our sailboat Groovy behind at our broker’s docks in San Diego, she was in as pure and virginal and showroom-ready condition as she would ever be. She wasn’t sold yet, but we had moved everything off of her and we were leaving her behind so we could resume our land-based travels in our trailer. Our truck was ready and waiting in the parking lot, stuffed to the gills with our remaining personal belongings, and we were polishing our way out of the cabin and into the cockpit. Suddenly his eyes lit up and he ran off to a dock cart that was overflowing with our last boxes of stuff. He rummaged through a little container of knick-knacks and then came back into the cockpit. 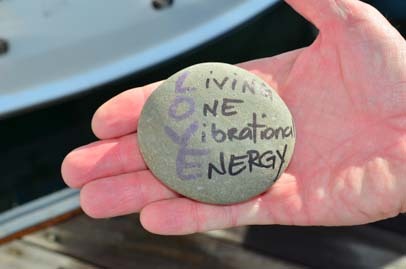 Some weeks earlier he had been given this odd stone by an intriguing, nature loving, free spirited woman we had met while we were prowling around at nearby Sunset Cliffs. 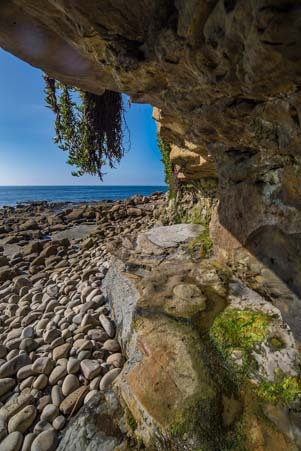 We had noticed her doing some reverential poses on the rocks, her long hair and soft dress billowing out behind her. She had seemed to be summoning the spirits of the sea by the water’s edge. It was a classic California sighting, and we chuckled to ourselves. But then she turned and began to engage Mark in conversation. She was loving this day — the ocean and the sky and the beauty of everything — and she wanted to share her good feelings with all the world. Suddenly she cupped her hands around this little stone and pressed it into Mark’s palm. Then she wafted away. He slipped the stone in his pocket, amused and touched by her unusual gift. Now Mark put the stone in my hand, and I rubbed its round, smooth surface. There was something appealing about it and the funny way it came to us. With that, he knelt down by the hull while I grabbed my camera. He held the out stone and let it fall. Such a simple gesture. Such a fleeting moment. But the gravity of it caught us both off guard. Suddenly we were embracing, tears in our eyes. A neighbor on a newly purchased Hunter 46 spotted us from his cockpit. His Mexico cruise was still ahead of him, and for the few days we had been docked side by side, he had been as excited about loading up his boat up with goodies as we had been about unloading gear from ours. “It has to be bittersweet…” he said as we walked past him on the docks. His bright smile oozed happy anticipation of his own adventures ahead. We nodded with a sniffle and trudged up towards the truck. We promptly bumped into our broker who greeted us with a great big salesman’s grin. But his expression changed to a look of surprise when he saw us blowing our noses and wiping our eyes. Not so with the Groovy boat. She was our little home on the sea, a fabulous cruising platform and our dream boat. I have never cried when I moved out of any other home. I have always been excited to leave. I’ve never felt a deep emotional attachment to any house I’ve owned. But saying goodbye to our little pad on the water was really hard for both of us. We had poured our hearts and souls into making her as ideal for living aboard at anchor as possible. We had lovingly polished every inch of her, inside and out, over and over, and we had worked on every system, from the tiniest pump to the largest sail. 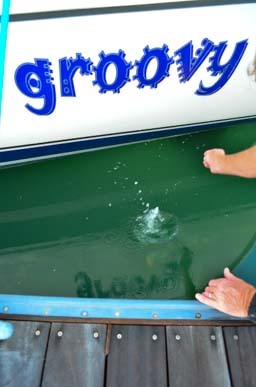 Groovy was a wonderful little floating home for us. That’s the way it is with boats. You get to know them on a very intimate level! She had delivered handsomely on all the promise we had seen in her when we first laid eyes on her. Steadfast and secure, she had taken us to all kinds of new sights and experiences, in safety and in style. There were lumps in our throats as we drove the city streets out onto the highway in the morning light. 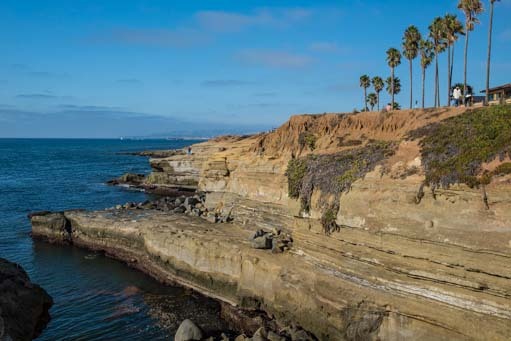 But by the time we crested the hills that separate the lush coast of San Diego from the desert to the east, we were smiling again and talking excitedly about the future. We had closed a beautiful chapter in our lives and were now turning the page to see what would happen next. 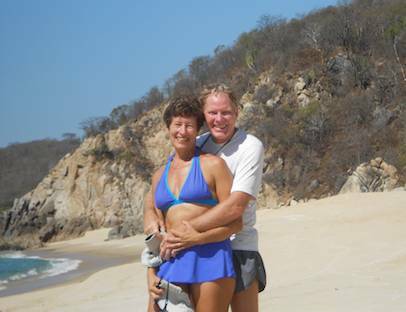 June 2013 – We’ve been living the Good Life here at Paradise Village Marina in Puerto Vallarta for three months now. Wow! This is a wonderful place to hang out, and lots of folks stay for years at a time. But the reason we have stayed here so long is actually because we’ve been doing a lot of soul-searching and thinking about our next move. We’ve had an unbelievable run of good fortune and exciting times this past year. Last summer in our trailer, and this past winter in our sailboat, we were gifted with one beautiful experience after another. Our Lady of Guadelupe church. It seems that everywhere we went we met kind and caring people who quickly became friends. It may seem strange, but on that very high note we have decided to make a huge change in our lives and take Groovy back to California and gradually close the cruising chapter of our travels. After sailing up and down Mexico’s west coast several times, we have fulfilled our cruising dreams completely — and then some. Monte Alban – How stirring it is to see these ancient pyramids. Throughout our travels this past year, in the background, behind all our exhilarating escapades, we have been digging deep in our hearts and pondering all the different ways we could move forward with our cruising lifestyle. Cruising is a unique way to travel. Even though you move from place to place, the focus is always ultimately on the boat and the process of boating rather than on the destinations you visit. We have found that to be true! When we started cruising we had already traveled full-time by RV for two-and-a-half years. We thought that cruising would be much the same as RVing, just doing it on the water instead of land. 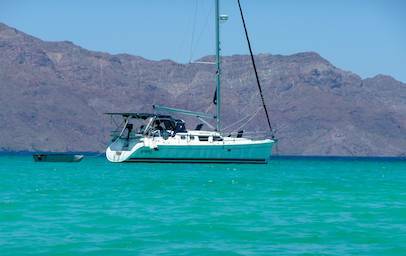 Sea of Cortez – RVing on water? But we have found that while RVing is all about the destinations we visit, cruising is largely about the boat. Why is the boat such an important part of cruising while an RV is so much less important in RVing? Because a cruising boat is a very complicated vehicle. The boat’s Plumber, Electrician and Mechanic are all very busy people as they work to keep the boat’s power plant, water treatment plant, sewage plant, mechanical propulsion system and wind propulsion system all functioning. Aboard Groovy, my sweet hubby Mark filled all these roles while I concentrated on navigation and sailing the boat. 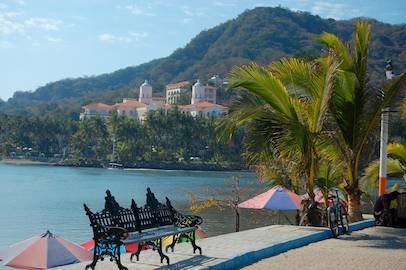 Barra de Navidad, a favorite cruiser hangout. Needless to say, we were both very busy, but Mark bore the brunt of the responsibility of keeping us afloat, and it weighed heavily on his shoulders. Unlike a sailboat, an RV, especially a trailer, has very simple systems that rarely require any maintenance or repair. 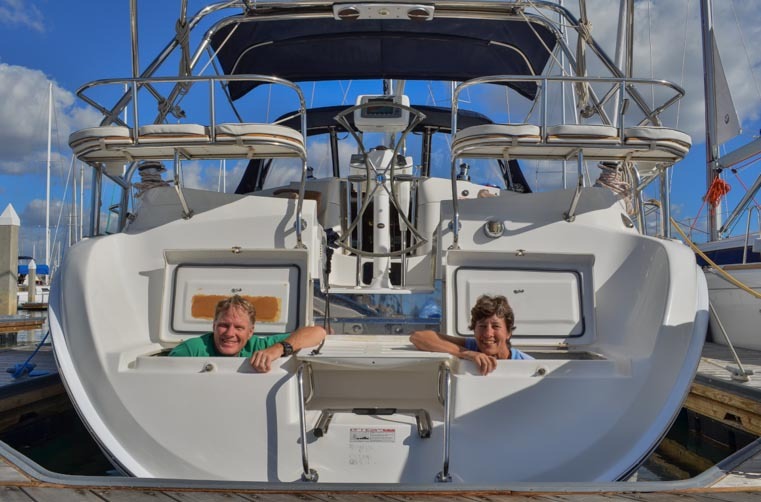 In addition to the boat itself being more complicated than an RV, living aboard a boat at anchor is infinitely more complex than living in an RV anywhere. In the cruising life, simple day-to-day tasks like provisioning, doing laundry and getting around require forethought, planning and time. They often involve dinghy rides, crazy beach landings, intense study of the weather forecasts and all-night travel. Just showering is an adventure!! And then there’s the simple maintenance of cleaning. After every sailing passage the entire boat would be covered with salt crystals, and although it was sometimes a fun adventure to swab the decks underway, it was still a chore that had to be done regularly! Not only did the decks need swabbing, but barnacles needed to be scraped off the bottom of the boat every few days. Every time I jumped over the side to snorkel and enjoy the reef fish, I took a few tools too so I could to spend an hour cleaning the hull! One huge surprise was the crazy noises at night. Nevermind the live bands that played at the resorts lining every beach in every anchorage, but the fish were surprisingly loud too! This often made sleeping a challenge, as the boat rolled relentlessly in almost every bay. on the back of the boat. In contrast, in the RV lifestyle you’ve always got wheels to get around, the weather plays a much less important role in travel planning, you can let a few weeks go between rig washings, and nighttime is for sleeping. Therefore, out of necessity, Travel, in the traditional sense of sightseeing, mingling with the locals and becoming immersed in a new culture, is a secondary focus in the cruising lifestyle. Santiago – Land of Sunrises! 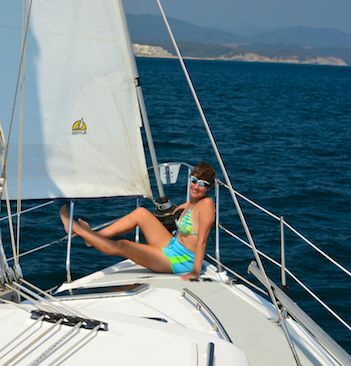 In our sailing travels we’ve found the happiest cruisers are those that have a deep and lasting passion for everything to do with boats and boating. Many are skilled handymen who love working in, on and around boats as well. We love our boat Groovy. It is our dream boat in every sense: beautiful, sleek, well engineered, meticulously maintained, easy to sail, and as comfortable as a sailboat of its size could possibly be. We have poured our hearts and souls into making it ultra-efficient for long-term life afloat at anchor. However, as we have cruised Mexico for the past three and a half years, we’ve discovered we are actually more passionate about Travel than we are about Boating. We are drawn towards seeing the sights, spending time with the locals, taking photographs and writing about our adventures. Time spent working on the boat and on the logistics of our lifestyle afloat often feels like time away from what we really wanted to be doing: traveling. 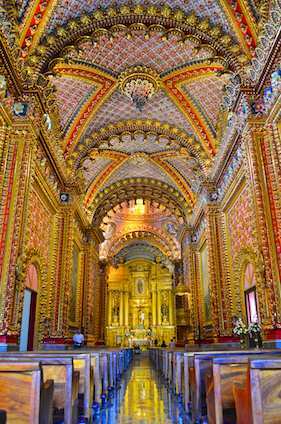 Our recent phenomenal trip to Guanajuato was a peak experience we’d love to repeat over and over. We absolutely loved our visit there. 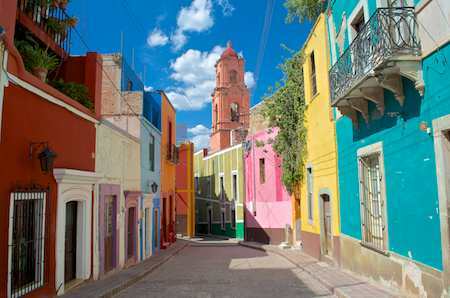 But Guanajuato is nowhere near the coast and has nothing to do with sailing, the sea, boats or living aboard. How do you put all this together? 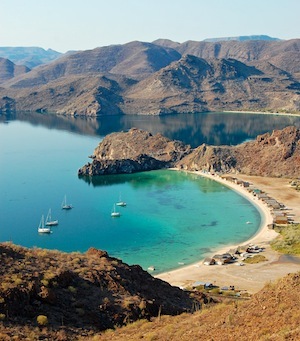 As we spread out our maps of Mexico and Central America and studied our options for cruising beyond Mexico’s border, we pinpointed the many fabulous destinations we wanted to go see and then thought long and hard about whether it would be best to travel there by sailboat or to go another way. 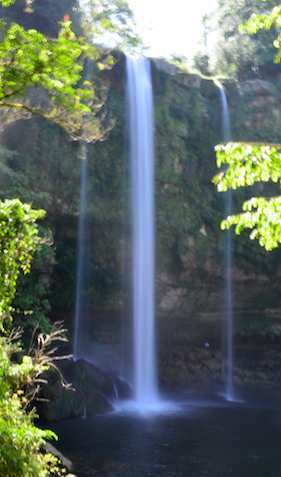 It turned out that most of our bucket-list locations were well inland from the coast and not easily reached by boat. Cruising further south just doesn’t make sense for us. If we could use the boat for just three months each winter and temporarily leave it behind inexpensively and with confidence that it would not deteriorate during the rest of the year and need loads of work upon our return, we might continue cruising. Then we could enjoy all the things we do love about boating each winter. However, that’s not possible, at least not in the areas we’ve explored that are within a reasonable distance of Pacific Mexico. 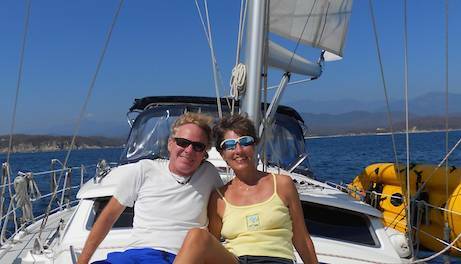 We will miss the lively day-sailing we’ve had in Huatulco, Acapulco, Zihuatanejo and near Loreto. It will be really sad to give up swimming off the back of the boat and living in our tiny home in the middle of beautiful tropical bays. However, we have lived that dream — and loved it — and we have three-and-a-half years of vibrant memories, tens of thousands of photos, and hundreds of stories that we bring away from the experience. 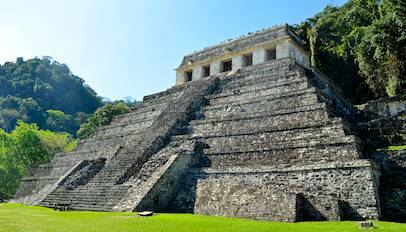 Palenque – An evocative and mystical place of the ancients that fascinated us. So we have made the most of our time in Puerto Vallarta as we have waited for July to approach. The 1,100 miles between here and San Diego are a very difficult voyage. The advice from experienced sailors that have made this trip many times is that the best months to go are July and November. 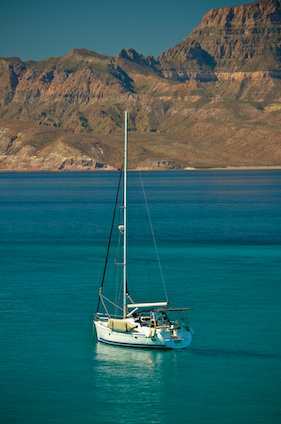 We are waiting for a weather window to make the first 280 mile (48 hour) jump across the Sea of Cortez to Cabo San Lucas. From there we will take it section by section, trying to catch the best conditions we can as we make our way up the 850-mile coast. 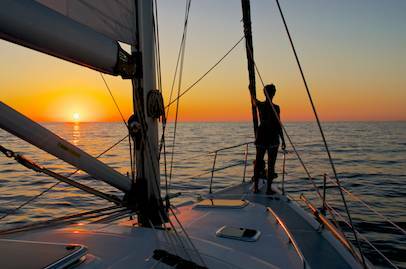 In the end, going cruising is all about dream fulfillment. The most important thing is to HAVE a dream and then to make it come true. Beach time at Playa San Agustin in Huatulco. The thrill of having a dream and making it come true is being able to live it, to live WITH it, and to find its true essence. Only when you are actually living your dream, day in and day out, can you decide which parts of it are dreamy and which parts need a little adjustment. Many people allow themselves to be scared away from pursuing their biggest dreams. The fear that pens them in is fear of the unknown. However, if you don’t jump into your dream with both feet, you’ll never know what that dream might have become once you wrestled with its limitations and figured out how to make it even better. 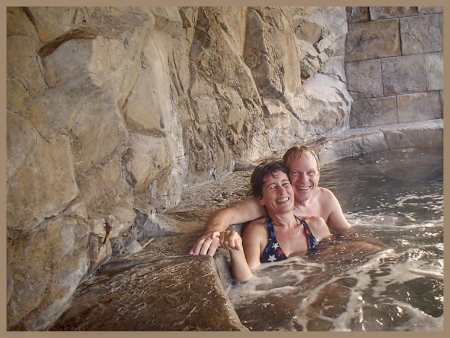 Enjoying some sweetie time in the wonderfully romantic hot tub at Paradise Villaage resort. It is said that cruising is about “The Journey,” and in our experience the most important journey you end up taking is one that goes within. It is a journey where you learn a little more about who you are and what you truly want out of life. As we have lived our cruising dream, we have learned that we are Travelers more than we are Cruisers. It took us a while to understand this. While we love doing both, our preference is to spend our time seeing new sights and experiencing other cultures rather than taking care of and living on a boat. 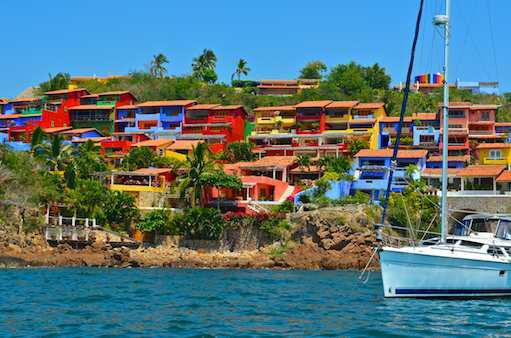 We can’t wait to see Mexico’s Caribbean side — by plane, bus and hotel! 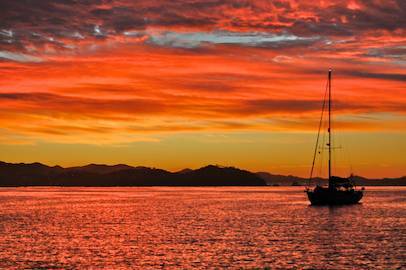 The sun sets before an overnight passage. 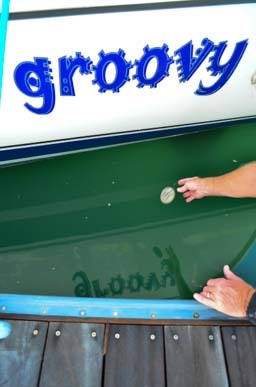 Once we get settled in San Diego, we will be offering our beloved boat Groovy for sale so she can continue her own adventures with new hands on her helm. She has been our “dream boat” in every way. We so appreciate all of you who follow our travels. We have many many more adventures ahead, not least of which is this upcoming voyage (yikes!). 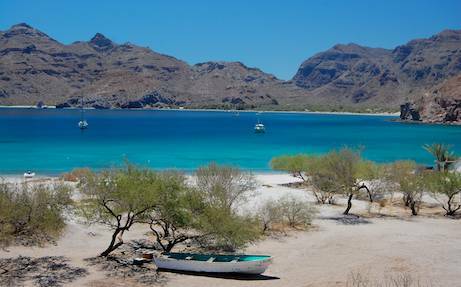 We should have internet in many locations along the Baja California coast, and we expect the trip to take about three weeks, so stay tuned for more stories from the sea and for many future land-based capers! For more comparisons of the cruising and RVing lifestyles, see the two articles I wrote for Escapees Magazine, “RVing by Land and Sea” and “Life Afloat and On the Road” which are about 1/2 way down this page in the Other Articles section. 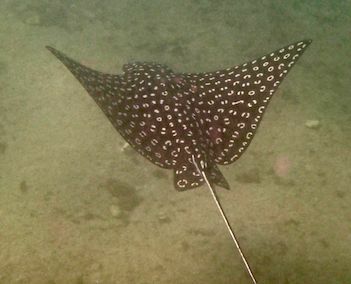 Posted in The Full-time RVing & Cruising Lifestyles	| Tagged Cruising Lifestyle, Cruising Start and End, Living The Dream, New, Our travels in brief - Snapshots! The Bob Hope commemorative statue park. Back on the boat it was time to take delivery. was signed over from seller to buyer "offshore"
The seller's captain signs off. Groovy is officially ours... What did we just do?? For two weeks we call Kona Kai marina home. sports a lot of funk. Now that's a coffee kiosk! Prepping for our sail to Mexico. Our test sails are a blast. were in short sleeves a few days ago. A happy family moment as the desert dwellers take to the sea. to purchase a boat a year ago. the market, but this time hugely discounted as a foreclosure. I shrugged it off. mixing with the locals on the white sand beaches of the Caribbean? comical game for both of us, but none of the names ever stuck. the boat 'Groovy'," we both knew we would be owners of a new boat. a total of 33 hours. long), the last unit of that model ever built. survey he had ever done. out to explore Seaport Village with them and catch our breath. was of each rock was beyond me. statues, carefully checking out each one. Segway lesson. Those contraptions look like so much fun. A few days later all the pieces were in place for us to close on the boat. from the trailer. But did this new move really mean stocking two homes? What about tools? Hoses? Holding tank chemicals? these wild emotions in check. wondered how we would fare. Once back at the dock, we hung out in the cabin in a state of disbelief. We had done it. Fourteen days from the time we left the islands, we were sitting on our own boat. Were we out of our minds? Marina in San Diego, one of the nicest marinas in the harbor. docks as bona-fide boat owners. documents, but there was still a lot more to do. 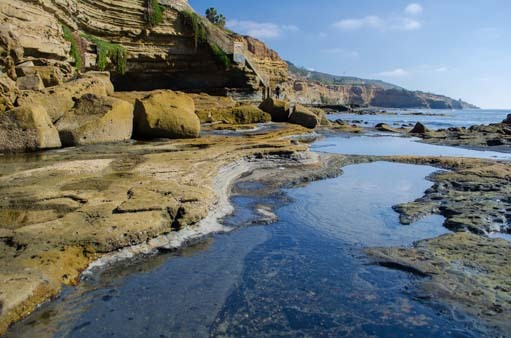 Mexico, 65 miles south of San Diego. where it seems that anything goes. 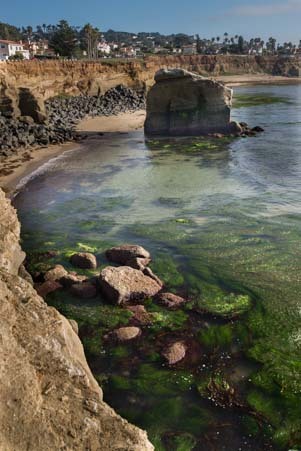 California beach scene for a while. coffee kiosk I have ever seen. sailboat, and starting a new chapter in our lives. wind, and what all those crazy markings on the charts are all about. errands to the big box stores as the rain fell in torrents. the sun came out, we were able to focus on sailing. Unsure what the difference is between a cheap inverter (left) and an expensive one (right)? Check out our Solar Power Tutorial! We use this clamp-on volt meter (left) to find out all we need to know about our electrical systems (we don't even have a battery monitor!). But, if clamping-on isn't your style, having a quality multimeter (right) in your toolbox can really help you figure stuff out! There are lots more of our favorite goodies in our Gear Store!